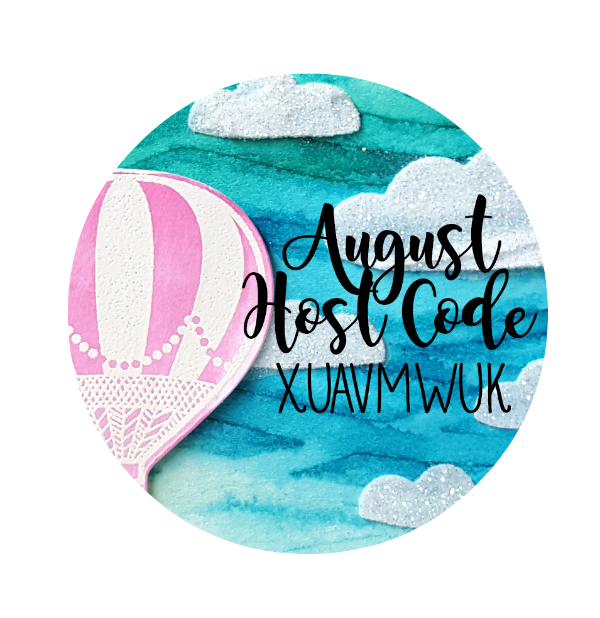 Hello, and welcome to the Aim for Alaska Blog Hop! I am Sarah Fleming, and I am in the USA. Aim for Alaska is Kylie Bertucci‘s training program. 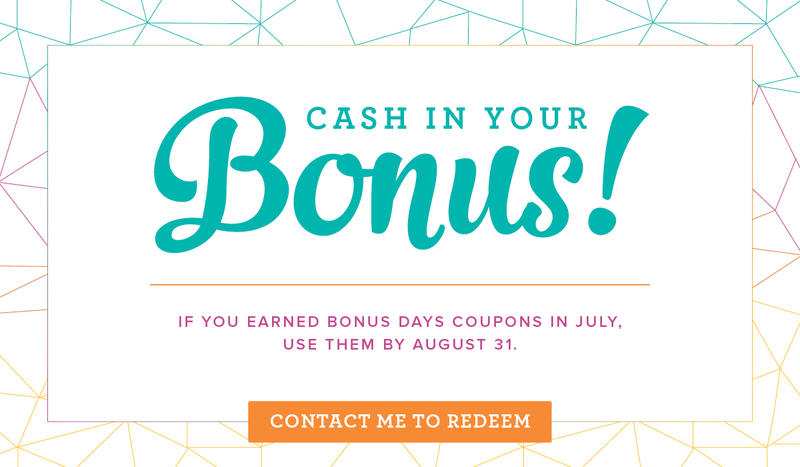 This program has helped my business so much! I’m very grateful to be part of this wonderful group and am excited about her new program that starts in October, Go for Greece. 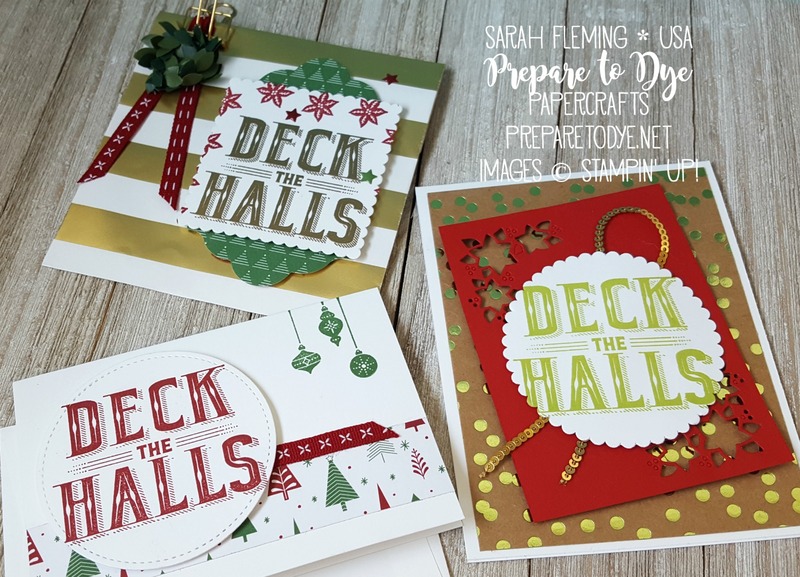 Today we are hopping together, and we are all using sneak peek products from the new Holiday Catalog! All of these products will be available to order on September 1. I can’t wait until the catalog is live for everyone! My projects today both use the Tags & Trimmings bundle. 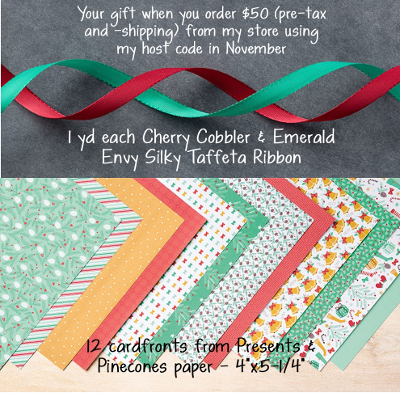 First I made a pillow box gift card holder using the dies in the bundle. These little pillow boxes are the perfect size for gift cards. I cut mine out of Real Red cardstock. I trimmed off the end tabs (those are for attaching a pillow box to the back of the die cut stocking), taped the side flaps together using Tear & Tape, then taped down the end flaps on one end. I didn’t tape the other end, to make it easy for the recipient to open and reuse. I tied the box closed with Whisper White Baker’s Twine, then decorated the box. Before tying the bow, I attached a tag I made using the bundle. I stamped the tag with Old Olive (stamped off once), then stamped to/from in Archival Basic Black. I threaded the tag onto the twine before tying the bow. 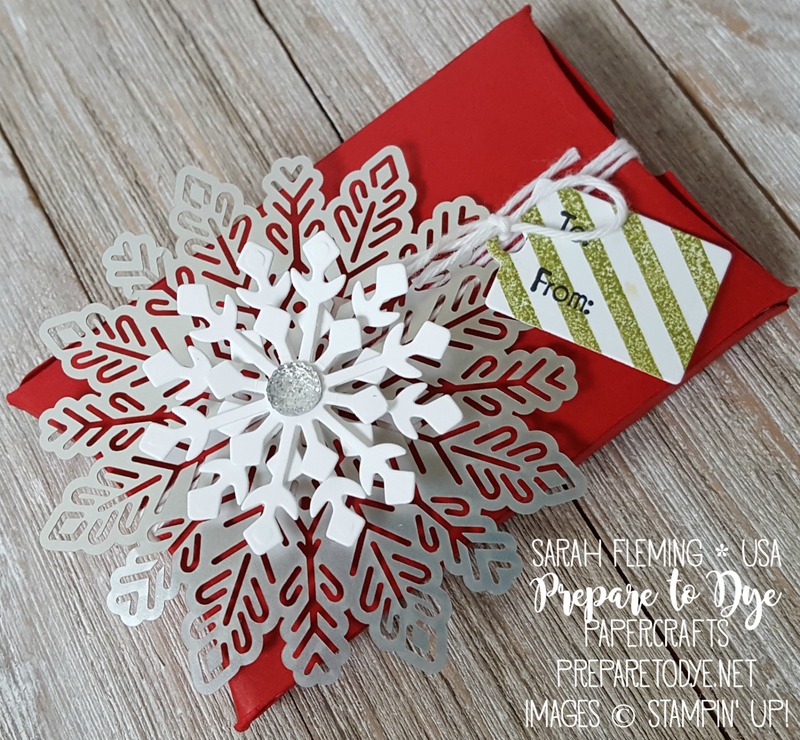 I used one of the new Foil Snowflakes (LOVE these! ), then two snowflakes cut with the Trim Your Stocking dies. I put these on the box using Dimensionals between every layer, then topped the snowflake off with a Clear Faceted Gem. I also made a matching card using the same bundle. My card base is Old Olive. 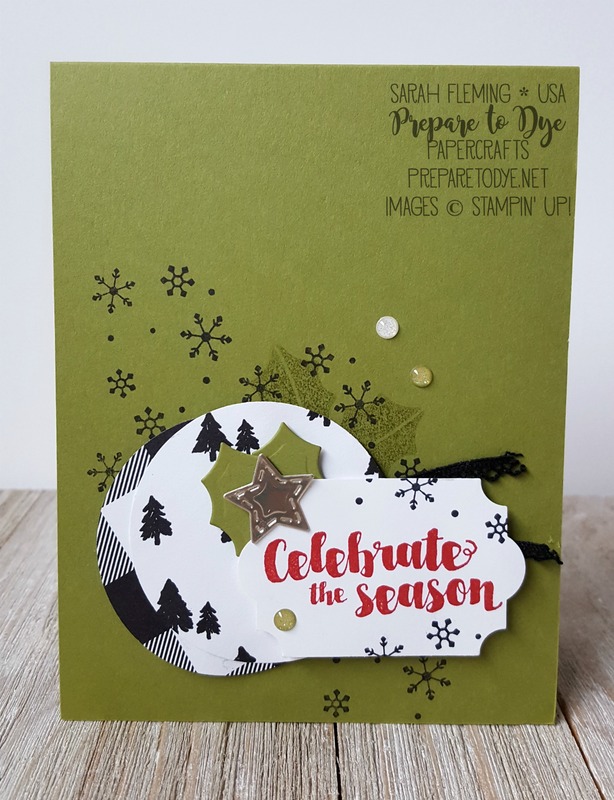 I stamped the black snowflakes on the card base. I also stamped three of the big holly leaves in Old Olive (stamped off once). I attached a couple strips of Vintage Crochet Trim to the card base before adding my focal point. 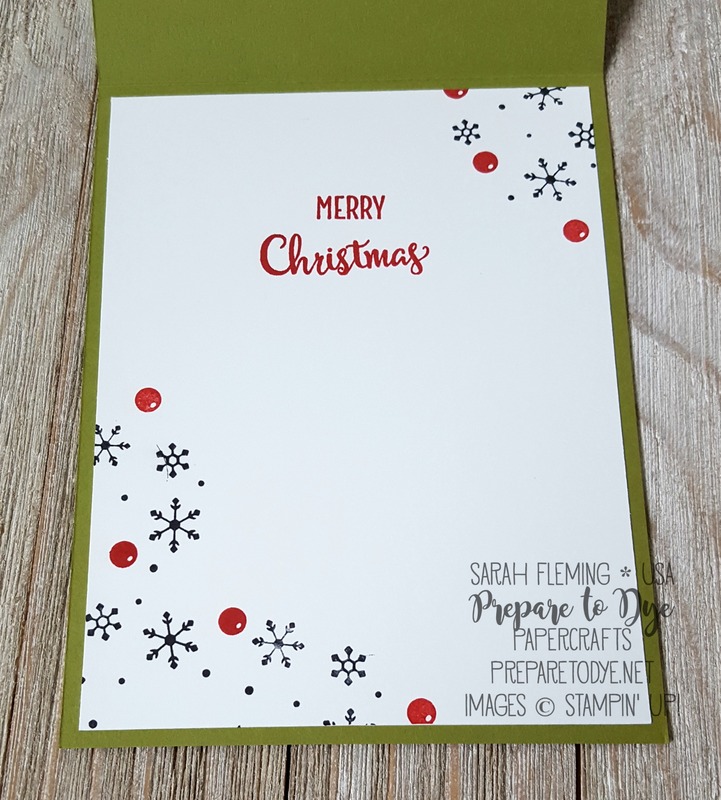 The punched paper is from the Merry Little Christmas designer paper. 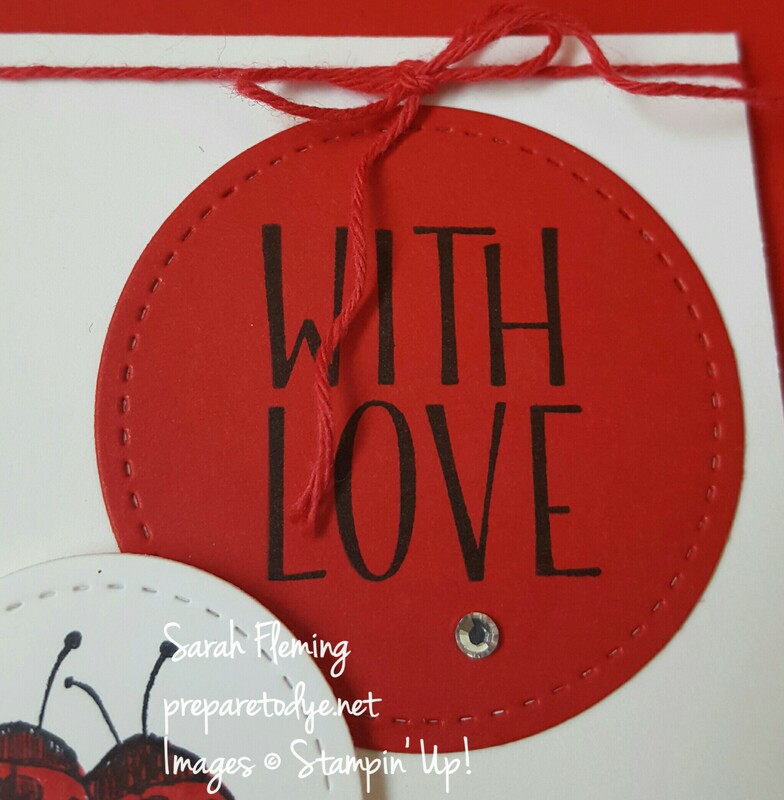 I stamped the sentiment in Real Red, then stamped some snowflakes in black around the sentiment before punching the sentiment out with the new Everyday Label punch. 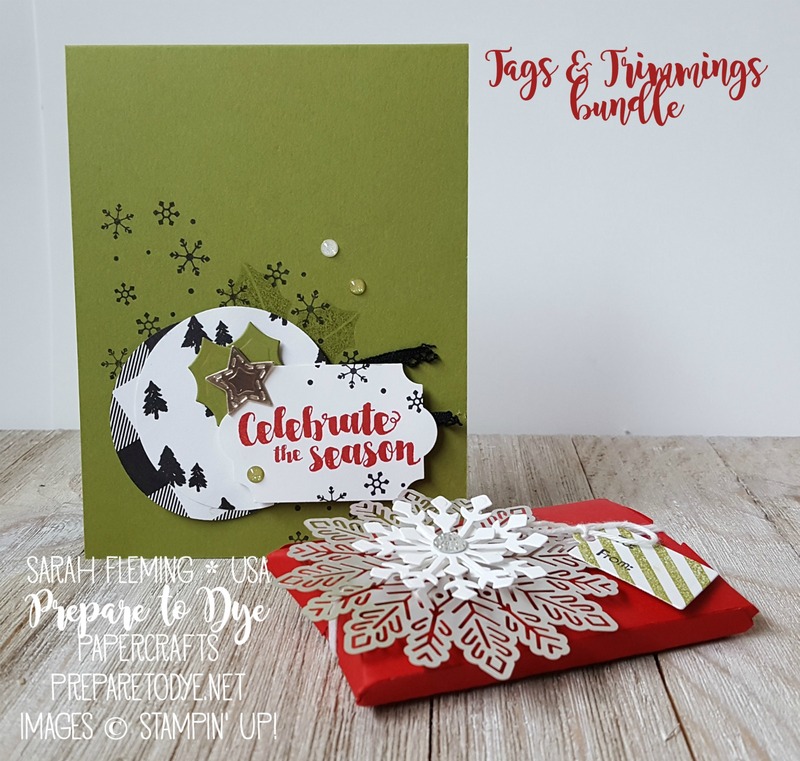 The die cut holly leaves and stitched star are from the same set. 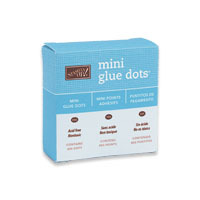 I added three Glitter Enamel Dots to finish off the card front. On the inside of the card, I stamped more snowflakes in Basic Black, then added some Real Red holly berries. 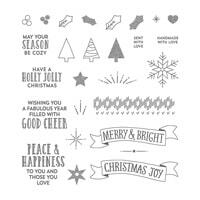 “Merry Christmas” comes from the Merry Café stamp set. I hope you’ve enjoyed the sneak peek today! Thanks for stopping by my blog. Make sure you follow the hop all the way around so you can be inspired by all the beautiful projects! Here’s a fun, easy card for you. 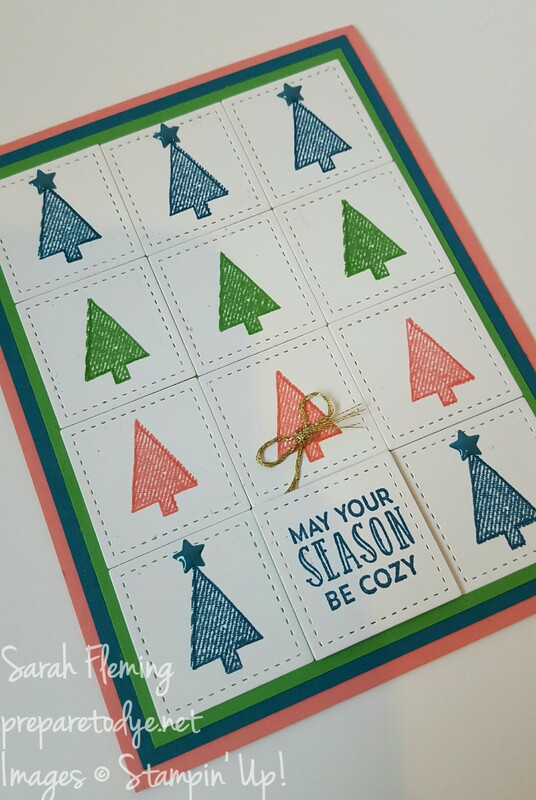 It’s not a quick card, but it’s easy and can be done in countless color combinations to suit your taste and whatever colors you have on hand. I CASEd (Copy and Share Everything) this card from Allison Okamitsu. I changed up the stamps, a little bit of the layout, and the colors. I love how I can copy a card and come out with a totally different look. It really simplifies card design when I’m in a hurry. Anyway, I loved Allison’s card so much that I wanted to make an exact copy, but I got distracted. As always. 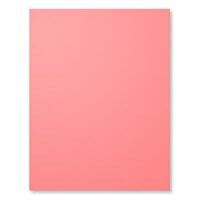 My card base and layers are Flirty Flamingo, Island Indigo, and Cucumber Crush. I thought this made a fun Christmas combo, but it works for any occasion. I cut out 12 squares using the smallest Stitched Shapes framelits square (those will be available again in January — that’s the official word, but sometimes it’s sooner than the estimate), then stamped on the squares with the Stitched with Cheer stamps (RETIRING!). I did some two-step stamping here. 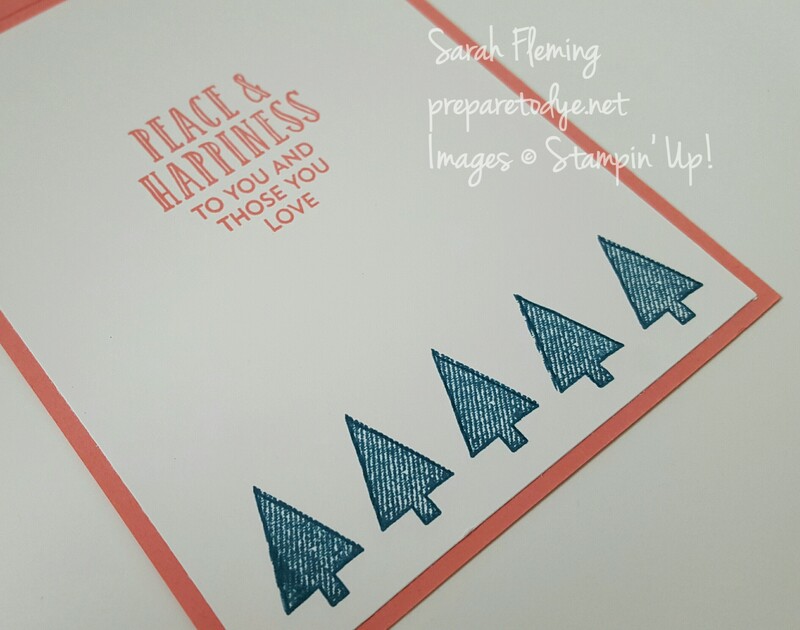 I first stamped the outline tree, then the denim-look tree right on top of it. 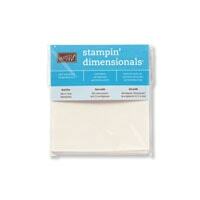 There are multiple two-step options in this stamp set. I love the versatility of it! I did a line of Island Indigo trees, then Flirty Flamingo, then Cucumber Crush, then another line of Island Indigo. You can mix it up and do all one color, multiple colors on one line, twelve different colors… Have fun with it! On the bottom line of trees, I replaced one tree with the sentiment. I love that this stamp set has big sentiments, small sentiments, banner sentiments, and even sentiments for the back of the card. I assembled all the layers using the Multipurpose Liquid Glue and popped the sentiment up on Dimensionals for a little extra interest. I added stars on top of all the Island Indigo trees; these are from the Regals Enamel Shapes. Love them. Finally I added a tiny bow using the Baker’s Twine Trio pack. I added a Whisper White layer to the inside of the card and stamped five Island Indigo trees along the bottom edge. Aren’t they cute? 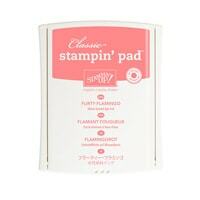 The Flirty Flamingo sentiment is also from the Stitched with Cheer stamp set. As we’re getting ready to spend time with our families over the holidays, the theme for this month’s International Project Highlights visual blog hop is quite appropriate. The theme is LOVE, and you’re going to love all the projects we have for you! 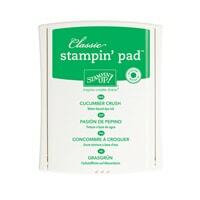 So welcome to our International Visual Blog Hop using current Stampin’ Up!® Products. 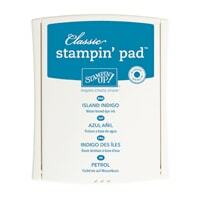 Please use this gallery from Stampin’ Up! demonstrators all over the globe to inspire you to create your own projects. We would love it if you could visit every one of our blogs and see close-ups of our projects and tips that we’re sharing. 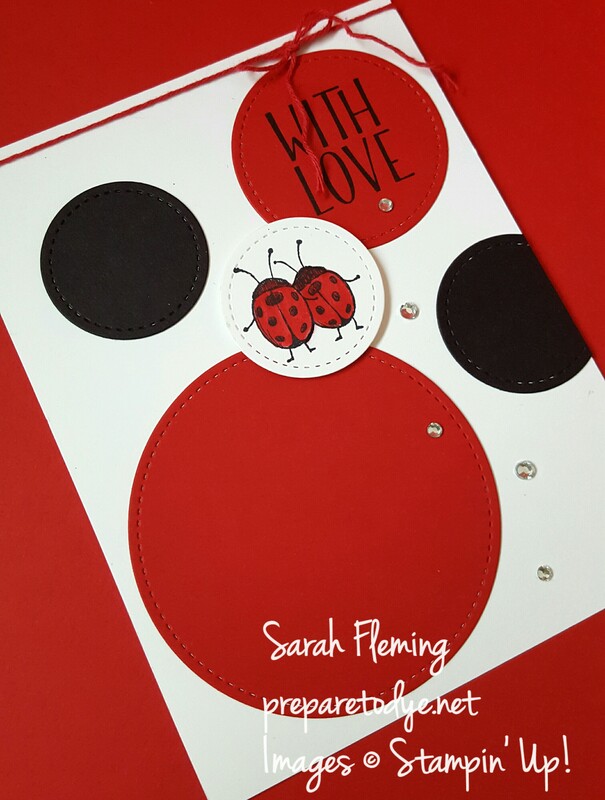 Our theme this month is LOVE because as card makers we love spreading the love. You can see the gallery below, and this will be on every blog that you click on so you will never be lost. I have to admit, I panicked a little when Facebook reminded me that this blog hop was coming up, as this completely sneaked up on me (or snuck up, as we say in Texas). Then more panic ensued when I remembered that we had a specific theme this time. I’m in full-on Christmas mode, so I wasn’t sure I could come up with a love-themed card. Not in the right head space for it, you know? And then I was looking through the stack of cards I made in a flurry after I received my Stitched Shapes Framelits last week, and wouldn’t you know, I’d made the perfect card for this! I’d completely forgotten I’d made it, but that’s the story of my life — no memory of anything, for the most part. That’s why I take lots of pictures and make scrapbooks. 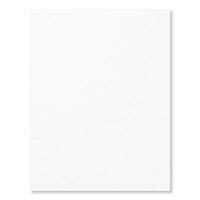 *My card base is Thick Whisper White. *I used the Stitched Shapes Framelits to cut out all of the circles. 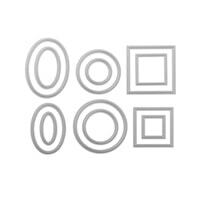 These framelits come with four sizes of circles, ovals, and squares. 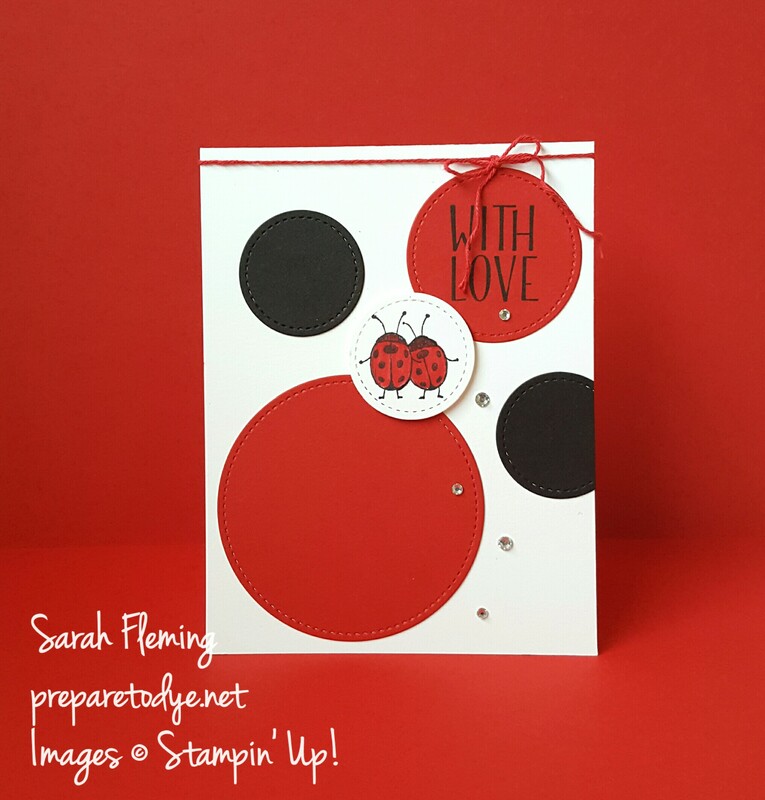 I had randomly cut circles out of scraps I had laying on my desk, just playing with the framelits, and then when I saw red, white, and black together, I thought, “Ladybugs!” I’ve hardly inked up my Love You Lots host stamp set this year, and I’ve been wanting to make a ladybug card for a friend, so this was perfect. I decided to use two Real Red circles, two Basic Black circles, and one white circle. 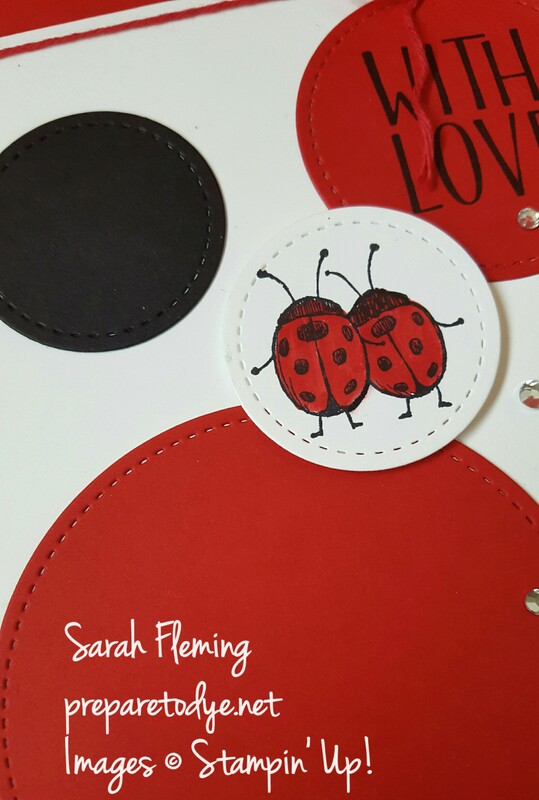 I stamped the ladybugs on regular Whisper White with Archival Black ink, then colored them with my Real Red Stampin’ Write Marker. *Look at that stitching! You’ll be seeing these shapes on most of my cards now until forever. I’m gaga over these framelits. 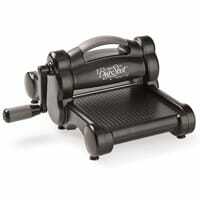 You will be able to order them again (we blew through the whole supply in two weeks!) on Monday the 28th. So whenever you order the 28th Online Extravaganza doorbusters, add these to your order! They’re just beautiful, and an absolute must-have. 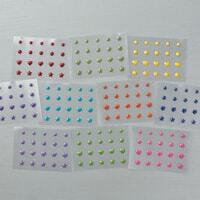 *The ladybugs are popped up on Dimensionals, and the other circles are glued down flat. I just trimmed off the excess on the partial black circle with my Snips. 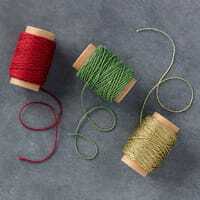 *The Real Red Baker’s Twine is from the Candy Cane Lane Baker’s Twine. I curled the ribbon a bit with the back edge of my Snips. *Would you believe this sentiment is from a holiday catalog stamp set? Yes! It comes in the Tin of Tags stamps — I think this beautiful set will be around for a long time. 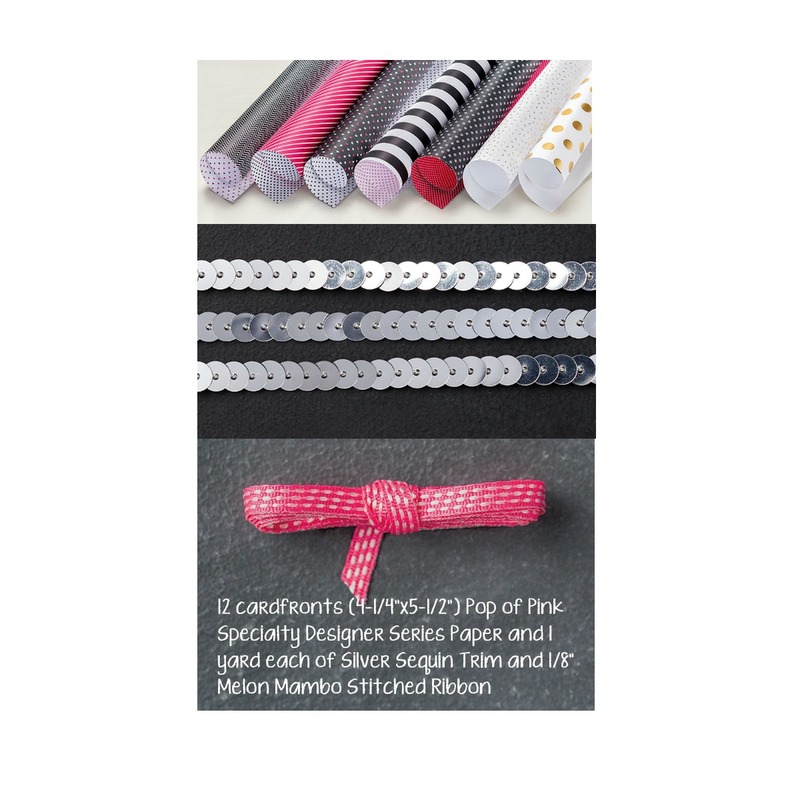 It’s the most versatile set in the holiday catalog — there’s so much you can do with it! 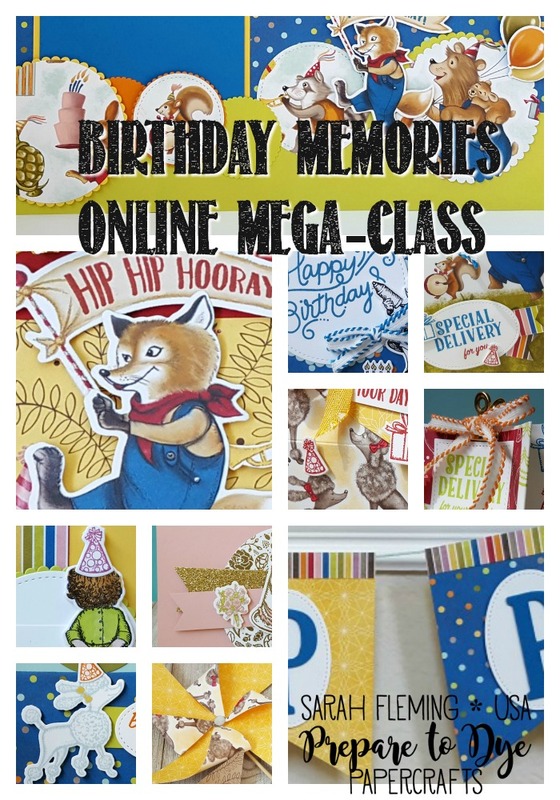 Babies, birthdays, holidays, Valentine’s Day, anniversaries — so many possibilities. And, best part, it’s 25% off during November. *I thought I was finished with this card, but I really felt pretty meh about it. I decided to jazz it up with some rhinestones, and yes, that was all it needed. Now I *love* it. Amazing how a tiny bit of bling can transform your card. Thanks for stopping by today. I hope I’ve inspired you to make something lovely and that you’ll keep clicking through the gallery for more inspiration!